Η TechArt βελτίωσε την Porsche 911 Turbo την οποία θα την παρουσιάσει στο φετινό στο Essen Motor Show. Ο Γερμανικός βελτιωτικός οίκος ετοίμασε ένα νέο αεροδυναμικό bodykit με ενεργή πίσω αεροτομή η οποία ενεργοποιείται είτε αυτόματα, όταν το αυτοκίνητο κινείται με ταχύτητες άνω των 120 χλμ/ώρα, είτε χειροκίνητα με το πάτημα ενός κουμπιού. Επίσης η TechArt έχει τοποθετήσει νέα εξάτμιση, carbon διακοσμητικά, τριάκτινο τιμόνι και νέες δερμάτινες επενδύσεις. Leonberg, November 2013 – After making their debut at this year’s Frankfurt International Motor Show, TECHART presents its individualization program for the new Porsche 911 Turbo models at Essen Motor Show for the first time ever. The combination of TECHART Front Spoiler I, stationary TECHART Rear Spoiler II, TECHART Roof Spoiler and TECHART Rear Diffuser Trim generates an ideal air flow to the complete vehicle involving the active aerodynamics of the series front apron. By precise adaption to the basic vehicle’s design language, TECHART-typical design features like side skirts, headlamp trims, Aero Wings and sport tailpipes enhance the character of the Porsche 911 Turbo models explicitly. 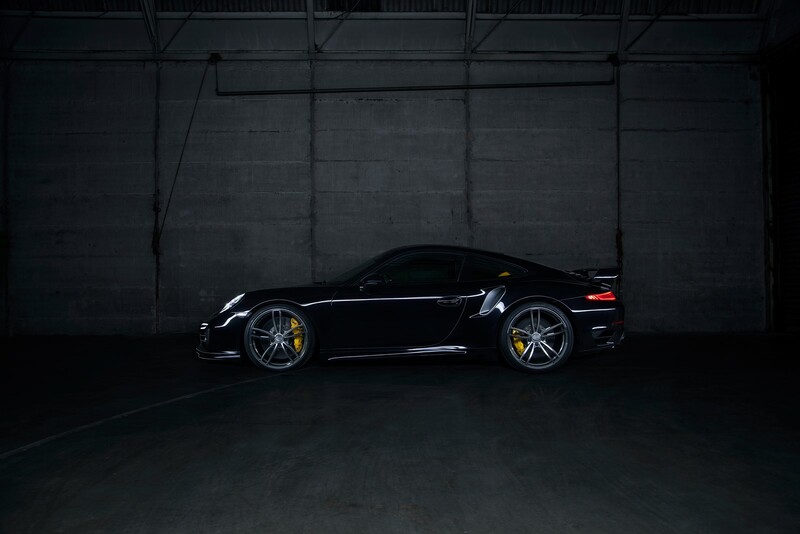 From November 30 to December 08 the TECHART individualization program for the Porsche 911 Turbo models presents itself to the public on new TECHART Formula IV light-alloy wheels. Wider, flatter and longer as its predecessors. The new Porsche 911 Turbo models make promises to performance, tradition and last but not least to technological leadership. A distinctive design as well as meaningful proportions and innovative aerodynamics express these attributes evidently. The TECHART Aerodynamic Kit copes with the characteristic design language of the basic vehicle in a technical, qualitative and stylistic way. The TECHART Aerodynamic Kit for the Porsche 911 Turbo models, made from a lightweight fibre composite of carbon and polyurethane RIM, is distinguished by high levels of load-bearing capacity and dimensional stability with a low tare weight. The TECHART Front Spoiler I for the Porsche 911 Turbo models incorporates the active aerodynamics at the basic vehicle’s front apron and thus supports its functional capability. TECHART Automobildesign controls the set up of the adaptive series spoiler at the vehicle’s front apron in a way that it either fully extends by the press of a button at speeds under 120 km/h, or does so automatically at speeds of over 120 km/h. When the driver reduces speed to 80 km/h the spoiler retracts automatically. The precise aerodynamic adaption of the vehicle’s front to the stationary TECHART Rear Spoiler II allows a perfect air flow to the complete vehicle and results in improved driving dynamics and stability throughout all driving conditions. TECHART Aero Wings, which are integrated into the front air inlets, create a dynamic shaft outline and form the prominent TECHART family face in collaboration with the TECHART Air Vent at the front apron. Besides TECHART Headlamp Trims and TECHART Performance Décor set visual highlights. The innovatory power of the TECHART brand is not just visible from the vehicle’s front, but also from its rear. Air-flow-optimized TECHART Side Skirts give a more compact appearance to the vehicle and guide the TECHART design language to the rear. The TECHART Roof Spoiler assimilates the typical roof line of the Porsche 911 Coupé models and forms an aesthetic and functional unit with the stationary TECHART Rear Spoiler II. The TECHART Diffuser Trim, framed by the TECHART Sport Tailpipes made from stainless steel in dual oval tube design, completes the TECHART Aerodynamic Kit harmoniously. A TECHART Sport Exhaust System with valve control and a TECHART Sound Muffler Kit Sport are going to generate solid acoustic performance for the Porsche 911 Turbo models. Both system are about to be developed. The strength of the most powerful Porsche 911 models is emphasised by the new 21-inch TECHART Formula IV light-alloy wheel in 5-twin-spoke design. It is available in standard or individual colours as well as in bi-colour finish. The weight reduced TECHART Formula III forged wheel in 21-inch can be ordered for the Porsche 911 Turbo models in standard or individual colours, in bi-color finish as well as in ceramic burnished glossy smooth finish. The classical TECHART Formula light-alloy wheel in 20-inch is also available for the Porsche 911 Turbo models. TECHART Automobildesign develops a new TECHART 20-inch light-alloy wheel with center lock for an even more agile driving behaviour. 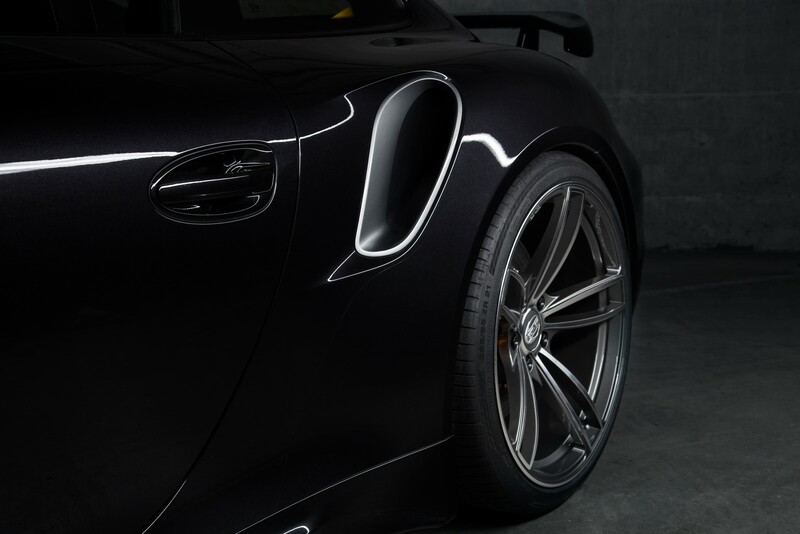 The TECHART Sport Spring Kit is going to bring the vehicle body closer to the tarmac. In addition TECHART Automobildesign works on a TECHART Noselift System, which has already been available for the Porsche 911 Carrera and Carrera 4 models. It convinces due to reliability, rapid and quiet height adjustment, trouble-free retrofitting and TÜV certification. 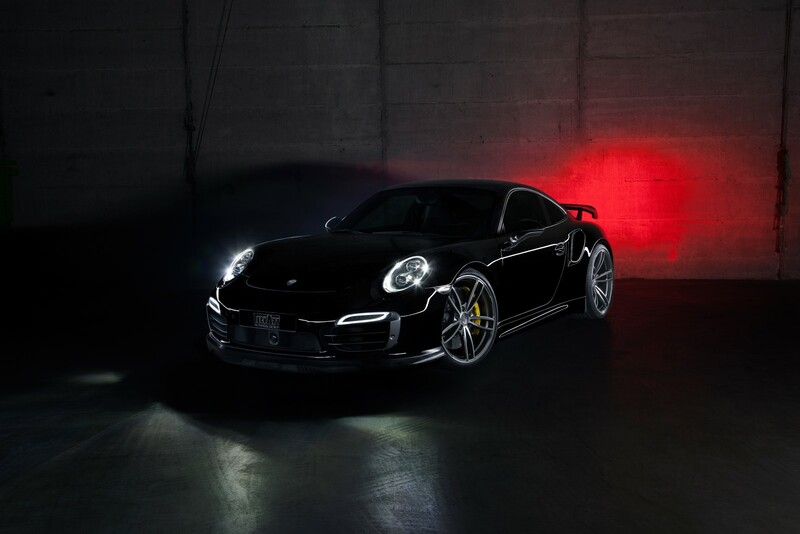 Make a note: TECHART Automobildesign targets the world premiere of its legendary TECHART GTStreet program based on the Porsche 911 Turbo models for the 84th Geneva International Motor Show next year in March. According to their predecessors TECHART Automobildesign is going to offer power kits for the new Porsche 911 Turbo models as well. The in-house saddlery uses precise handiwork to incorporate the exterior design of the TECHART individualization program for Porsche 911 Turbo models to the vehicle’s interior. The new illuminated TECHART Aluminium Door Entry Guards can be designed individually and represent an eye-catcher before the driver takes a seat behind the ergonomically shaped TECHART 3-spokes Multifunctional Sport Steering Wheel with TECHART Paddle Shifters. TECHART Aluminium Sport Pedals and TECHART Aluminium Foot Rest provide ideal grip for precise control of throttle and brake. Whether TECHART decorative stitching, backrests for sport seats Plus in leather, safety belts or in-house produced TECHART Interior Styling Packages in coloured carbon fibre. All vehicle details pick up the stylistic theme constantly. Also in terms of the dashboard instruments, refined by TECHART, with easily readable TECHART dials, harmonized rings and Sport Chrono device in leather. TECHART Automobildesign GmbH, with its headquarters in the Swabian town of Leonberg, is setting global standards when it comes to the customisation of vehicles from the Porsche brand. Founded in 1987, TECHART has been living this passion for over 25 years under the leadership of the two managing directors Thomas Behringer and Matthias Krauß. The consistent implementation of their ideas and targets has seen the company develop into a global business with over 70 employees and sales in over 30 countries. From aerodynamics and exterior designs, to technical optimisations in all vehicle sectors, to the refinement of interiors by the company’s own upholstery shop, the TECHART range covers all Porsche series and models. Approved as an internationally registered vehicle manufacturer, TECHART has established itself as a premium brand for the refinement of Porsche cars worldwide.